"Virgin Atlantic has become the third airline to restrict the use of Apple and Dell laptop batteries on its flights. Passengers who want to take their Inspirons, Lattitudes, iBooks, PowerBooks, MacBooks or MacBook Pros onto the carrier's planes are asked to remove the battery first. "Like Korean Air, which recently instituted its own battery ban, Virgin Atlantic isn't preventing such notebook owners from operating their laptops, but it is limiting them to seat-side power supplies. Flying coach or economy without an in-seat power supply? Then you can't use your Apple or Dell machine." "Like the MacBook, the N10 ships in white, with a recessed, button-like keyboard. Put 'em side by side and you might almost think they'd been separated at birth." "Almost every PC notebook vendor and their brother is hawking Core 2 Duo powered notebooks these days and Mac-heads are starting to get a little miffed. Understandably so. "Didn't Apple jumped into bed with Intel because they had a great chip pipeline and they could deliver the silicon - fast? Yes and yes. This time Apple can't blame their inability to ship on Intel, though. It's their own doing. "I've previously posted that Apple will release a MacBook Pro based on the Intel Core 2 Duo (formerly 'Merom') processor in late October or early November and sources indicate that this is pretty close to the mark." "Intel will ship its first Core 2 Duo-derived Celeron M budget notebook processors in Q1 2007, Taiwanese industry sources have claimed. At the same time, the chip giant will offer low-voltage versions of its current 'Merom' line-up, they say." "Concerns over exploding computer batteries may be heating up, but alternative power sources for portable devices like laptops, music players and cellphones could still be up to 10 years away. "'There is nothing in the near term that can satisfy all the requirements that have to come from a battery, It has to be light, small, last a long time and relatively safe,' said NPD Group analyst Stephen Baker...."
PR: Cambrian House Inc., a Calgary-based software company with a unique crowdsourcing business model, announced today the launch of their new fundraising campaign "Follow the White Laptop". The campaign kicked off by delivering a new white MacBook to Guy Kawasaki the former Apple evangelist, in hopes of him signing it and sending it off to another "technology rock star". "The goal of the campaign is to get as many signatures from luminaries in the technology sector as possible and then auction it off on eBay early next year," says Michael Sikorsky, CEO of Cambrian House. "This is a great cause that all our employees are passionate about, and I feel it is important as a company to sometimes step back from our everyday operations and focus some energy to giving back to those who are less fortunate." All proceeds of the auction will be donated to the Youth for Technology Foundation, an international nonprofit organization that seeks to bridge the digital canyon among disadvantaged communities in developing countries, starting with the continent of Africa. The company is hoping the laptop gets passed onto a diverse range of technology entrepreneurs including people like Bill Gates (Microsoft), Kevin Rose (Digg.com), Steve Jobs (Apple), Ze Frank (zefrank.com), and Chris DeWolfe (MySpace). "We are very lucky to have Guy Kawasaki kick off our campaign, and we look forward to seeing who he sends it off to," says Sikorsky. "If you decide to shut down your Apple portable computer rather than putting it to sleep, be sure you allow it to shut down completely before you close the display." PR: TechRestore, Inc. have announced that they have begun offering an overnight Glossy Screen Upgrade for PowerBook G4 Systems. PowerBook G4 owners that are scheduling an overnight screen replacement now have the option of selecting from the standard matte finish LCD screen or upgrading to a glossy display. TechRestore's Overnight LCD Screen Replacement service provides a fast and hassle-free repair method for Macintosh laptop owners that experience a screen failure due to mechanical issues or accidental damage. The LCD screen repair program has a 24-hour turnaround time and flat-rate pricing that includes parts and installation at prices starting at $449 for PowerBooks and $349 for iBooks. "The new glossy displays offered on MacBook and MacBook Pro systems offer rich colors and darker blacks," says Shannon Jean, Founder and President of TechRestore. "We're thrilled to now offer existing PowerBook G4 owners the same glossy screen experience as current models when performing a screen repair." The TechRestore flat-rate LCD repair service is a complete, door-to-door overnight service for customers in the continental U.S. Once a repair is scheduled, a RestoreBox is sent via overnight courier to the customers home, office or school where their system is picked up and brought back overnight to TechRestore. Within 24-hours of receipt, a new LCD screen is installed and the system is sent back to the customer's location via overnight courier. Customers outside the U.S. can use TechRestore's Self-Restore service to schedule a screen repair. The Glossy Screen upgrade option is $79 for PowerBook G4 12", 15", and 17" systems, and it is available immediately. PR: The Laptop Stand is attractive, built with strong materials, lightweight, and affordable. As well as mounting to any standard camera or video camera tripod, it can be used on any flat surface. 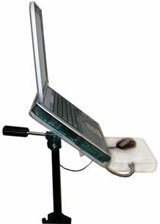 The Laptop Stand is fully adjustable for viewing your laptop - a safe surface on which to mount your laptop. Available in 3 different models ( Widescreen, Standard, and Mini ) The Laptop Stand can be packed away with your laptop in your laptop case for portability and extra stability for your laptop. The Laptop Stand will support virtually all models of laptops from Mac to PC. The Laptop Stand is strong, lightweight, sleek, and totally adjustable. Now you can bring along The Laptop Stand wherever you go. The Laptop Stand attaches to any video or standard camera tripod securely and easily. 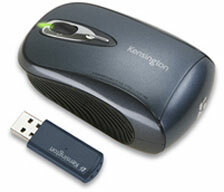 Great for business presentations, classrooms, audio video setups, and countless other applications. The Laptop Stand also works great for projectors, propping up books, as a writing surface in bed, or for use on a podium. Its attractive design makes it fit in with any decor. Bring your laptop virtually anywhere. It also attaches to your tripod in seconds for an instant work desk for your laptop. Use it at the airport, in the office for additional space, or even take it to the park. The Laptop Stand can match you. Colors available are standard Clear, Blue, Red, Yellow, Green, Black, and White. Custom colors can also be ordered. The Laptop Stand can be attached to any video or standard camera tripod for diverse applications. The Laptop Stand is attractive, built with strong materials, lightweight, and affordable. The Laptop Stand is built in the USA. The Laptop Stand is fully adjustable for viewing your laptop. The Laptop Stand is a safe surface to mount your laptop. The Laptop Stand can be packed with your laptop in your laptop case for portability and extra stability for your laptop. The Laptop Stand will support virtually all models of laptops from Mac to PC. Add a tripod to your order to create a full kit. With a comfortable sculpted design, high-resolution laser tracking, and 2.4 GHz wireless technology, the Kensington Si750m provides the ultimate in mobility and precision on the road. Battery indicator light blinks green to red as the battery level is used. Up to 6 months of battery life on 1 AA battery. 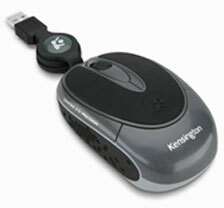 With a comfortable midsize shape, sculpted grips, Performance Optical tracking and 2.4 GHz wireless technology, the Kensington Si650m is the ideal mouse for your desktop or notebook. 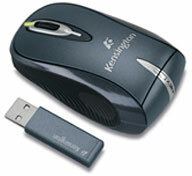 Si650m Wireless Notebook Optical Mouse is backed by the Kensington 5-Year Warranty and free technical support. Better performance for the office or the road. With a flexible design and soft, comfortable grips, performance optical technology provides 1000 dpi tracking, the Kensington Ci65m is the perfect companion to your notebook computer. With a flexible shape and soft, comfortable grips, diamond eye optical tracking, and a retractable cord, the Kensington Ci25m is perfect for all your travels. Retractable cord extends to 30"
Wrappers has launched a range of corduroy covers for Apple MacBooks . 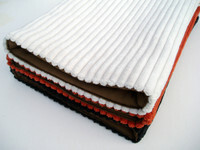 The contract quality sleeves can be personalised with your ID on the tag and are available now in five autumn colours. 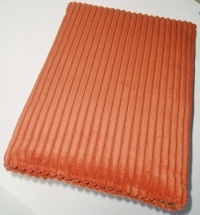 Wrappers jumbocord covers for Apple's MacBook are made from contract quality corduroy. 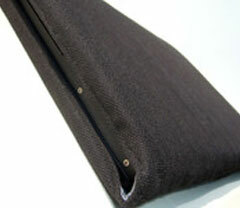 Contract quality means the fabric has passed a 100,000 wear and tear rub test. The fire retardant backing uses the latest graphite granule technology, which as well as a safety benefit, prevents the corduroy loosing its shape over time. Sleeves have a layer of cushioning for added protection and a chestnut coloured microfibre lining. The autumn collection comes in five, natural fall colours: Raven, not jet but soft black for a good match with Apple's black MacBook; Tobacco, a muted, earthy brown; Terracotta, the strongest colour in the collection more natural brick than electric orange; classic Ivory and finally Taupe, a soft, subtle colour which is a slightly darker, cousin to Ivory. Wrappers' corduroy sleeves feature exclusive tailoring that avoids leaving one end of the MacBook exposed, without the need for zips or Velcro. Wrappers has launched a heat resistant rubber sleeve for Apple's MacBook 13 inch. The cover doubles as an insulated mat that reduces the heat felt on your legs when using a notebook on your lap. Made from high quality, heat resistant rubber, the slimline mat is less than a centimetre thick but insulates against temperatures up to 250 degrees centigrade. Wrappers has launched a range of peach skin linen sleeves that you can personalise with your initial. 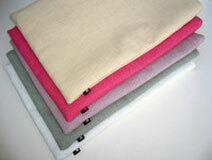 The new sleeves are available in five colours and are tailored to fit Apple's MacBook 13" notebook. In stock now priced from £15.99. 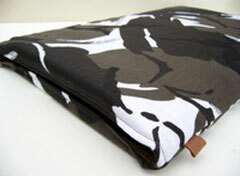 Wrappers has launched an Urban Camo sleeve tailored to fit Apple's MacBook 13 inch notebook. The monochrome sleeve looks equally good on matte black and shiny white MacBooks. Wrappers has added three new lining colours to its denim MacBook cover. The padded blue denim sleeve is available with a choice of brilliant white, cherry red, navy blue, army green or orange lumo microfibre linings ( see picture above). Wrappers has launched a heavy duty matte black utility canvas sleeve tailored to fit Apple's MacBook 13 inch notebook. For a customised cover, Wrappers will add your ID to the tag on your bag. Personalised tags cost an additional £3.00. PR: Nova Media has introduced GlobeSurfer ICON, a USB modem to establish mobile Internet connections with any Macintosh Computer running OS X 10.3.9 or higher. The ICON supports HSDPA and 3G UTMS speeds in Europe and Asia as well as EDGE and GPRS connections around the globe. "We are happy to offer a HSDPA solution for all Macs without a PC Card or ExpressCard slot! ", states Jan Fuellemann, PR spokesperson at nova media. 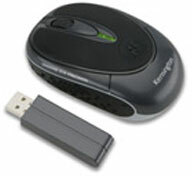 "GlobeSufer ICON is USB-powered and extremely handy. It is possible to connect an external antenna to boost the reception in areas with low signal quality." GlobeSurfer ICON includes the Internet connect wizard launch2net which offers a one-click connection to the Internet without the need to enter cryptic connection details. GlobeSurfer ICON is available today for €339 plus VAT at the company's website. PR: Lab Tick allows you to turn on your PowerBook, MacBook, or MacBook Pro's illuminated keyboard in the daylight. Have you ever been annoyed by your PowerBook's (or MacBook Pro's) backlit keyboard? You can not control it; you simply have to deal with the behaviour dictated by the ambient light sensor, which sometimes does not work really well. The idea of a backlit keyboard is awesome, but the implementation in Mac OS X has its flaws. Lab Tick aims to fix them. System requirements: Mac OS X 10.3.9 or later, PowerBook or MacBook with a backlit keyboard. Before the configuration changes, it saves the states (positions and sizes) of your windows. After the configuration changes, it moves and resizes your windows to match the way they were laid out the last time you were in this configuration. This way you can connect to low-resolution projectors with confidence, knowing that your windows will be restored to their current positions and sizes when you disconnect. If you work dual-head with a large external monitor but take your laptop home for the night, your windows will go back where you left them when you reconnect the next day. Forget-Me-Not is free and open-source, licensed under the GNU Lesser GPL. Forget-Me-Not is a preference-pane-driven app that runs in the background. It requires "access for assistive devices" to be enabled in the Universal Access preference pane. It does work for X11 windows. FMN has been developed and tested with OS X 10.4 Tiger, and should work with 10.3 Panther. Bug-fix release. Fixed all known memory leaks! Also excluded MS Word since it can't handle its windows being moved/resized. Not a laptop, but a pretty enticing deal in a flat panel desktop, especially if you already have a mouse and keyboard.